Is well known the theory of the three Fs, which applies not only in crowdfunding, but also when looking for funding to launch any business or project. According to this theory (if we can call it that way), the first round of funding is borne by the nearest persons or social circles of the person seeking funds. Thus, the three Fs correspond with Family, Friends and Fools. So, hence the title of the post. Like in the movie “The Godfather”, also in the crowdfunding “the important thing is the family”. Since there are some affective and proximity between crowdfunder and funders, three distinct advantages of using this inner circle appear to obtain financing. First, in principle, it is easier to get funding because it is easier to convince that your project is likely… and because many times, family or friends just want to help. Second, about the requirements of deadlines and similar situations, there is a greater margin of confidence. A familiar, who wants to help and also get a benefit, is not going to use the same level of requirements that a profesional investor, who just wants to get a profit… although in families you can find any kind of person. Third and finally, depending on the relative / friend / foolish, it is much easier to make these people, the closeness and the desire to help promote your crowdfunding project among his acquaintances and friends. However, these advantages have their counterparts. True, it is easier to get funding, but it is also true that the amount collected is usually low. This aspect will obviously depend on the socioeconomic environment of the crowdfunder who lanches the project. Moreover, this higher level of confidence is obtained because there is a personal relationship, and therefore a personal involvement with the crowdfunders. And is not the same, as an individual, to displease an inversor who you’re not going to see in your whole life, that to displease a friend who you will meet every week. Both situations must be avoided, but the second will haunt you longer and produce more uncomfortable situations. In this regard, it is important to do things right, planning the crowdfunding campaign realistically, taking into account all expenses, writing the conditions of both parties, etc. But in addition to the above, this first investment from family, friends and fools (that sounds bad), have an important weight in crowdfunding campaigns. This video explains it perfectly. Although it looks like a bet, sure there are many people who joins the crowd naturally. So who is the responsible of the final situation? The person who “dances” (or whatever he does) alone? The first boy who joins him? The second one? What is clear is that, if no one had been dancing with this guy, other people would not have joined them. The same happens in crowdfunding. For funding a project and give your money, first you have to see a project you like or that interests you. If you find it, and no one is funding the project, this fact won’t give you an overconfidence. Probably the most conservative funders will cower. But if this inner circle (FFF) has taken part even slightly, and there is already a certain part of the project funded, this is a different situation. 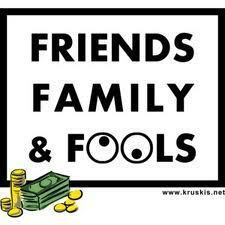 It is not imperative the first investment of “friends, family and fools”, but it is highly useful and recommended.